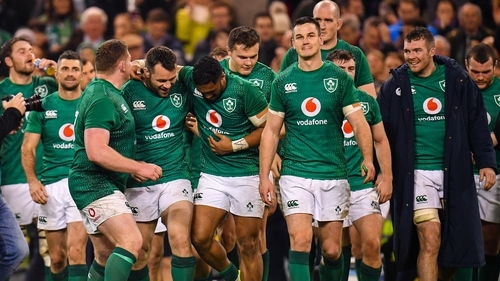 RTÉ Sport will televise 14 live matches from Rugby World Cup 2019, including all of Ireland’s matches, the knockout stages and a daily highlights show. Today’s announcement sees RTÉ secure TV rights to broadcast 14 live matches. This will include all of Ireland's games, all knockout stages and the final, as well as 16 nights of highlights. Joe Schmidt's team are among the favourites to win the tournament next autumn in Japan after a historic first win on home soil over New Zealand on Saturday. RTÉ’s 14 live games and 16 nights of highlights will be broadcast free-to-air on RTÉ2 and also on RTÉ Player live and on-demand. Beginning with Ireland v Scotland, all of Ireland’s pool games will be broadcast live as well as all knockout and final placing matches including the final on Saturday 2 November. Susan Brady, managing director of consumer and small business at eir commented: "We are delighted to have come to this agreement with RTÉ which again shows the changing nature of the sports broadcasting landscape in Ireland where we’re happy to work together to give Irish sports fans the best possible choice and content. "We’re really looking forward to the Rugby World Cup and fans won’t miss a single minute of the action live from all 48 games on eir sport including every Ireland game and the knock out stages."